Medics treat victims at Kunming train station after brutal knife attack. This China knife massacre happened on a regular Saturday night. 10 knife carrying thugs went into the Kunming train station and started slashing and stabbing people to death. The official reports say 29 innocent people were killed (plus four of the criminals by police) and 143 injured. If you do the math, that means each attacker killed 3 people while injuring more than 14 (a total of 17 victims each). I couldn't find out how long this massacre lasted, but if you've ever been in a sparring match, you know how tired you get, and how fast it happens. Can you imagine how tired they should have been just for hacking at 17 people. No doubt they had to chase their victims, so they should have gotten tired just by running. Lesson #1 Learn real street fighting to protect yourself. Wing Chun is good, and I always recommend adding TFT to your Kung Fu arsenal. There is a wold of difference between antisocial aggression and asocial violence. Wing Chun and most martial arts are good for dealing with antisocial situations. But I truly believe we each need something like TFT to help us deal with asocial violence. The real life and death situations. The ones we hope we never face. The kind that we cannot avoid or run away from. Sparring and competition is nothing like asocial violence. 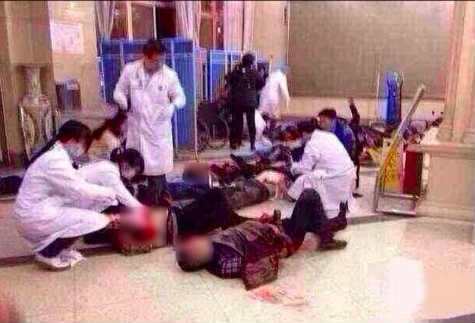 The train massacre in China is an example of what true asocial violence is like. Standing in a front stance, with your Man Sao up, looking mean, and hitting one of the thugs in the face with a straight punch or chain punch would not have done anything to diffuse the situation. Asocial violence can only be answered with asocial violence. Violence is the only answer to violence. These sociopaths killed 3 people and injured (possibly maiming) another 14 each. I don't mean any disrespect with this next statement, either, but I bet your sifu has never taught you to kill someone with your bare hands. Sane, socialized people who agree to the unspoken contracts of civilization do not kill people; and we're uncomfortable talking about it, too. You may feel a little uncomfortable just reading this letter. And so I bet your sifu has never taught you to kill or permanently maim another human being, and you probably don't train to do it, either. For most people, learning this stuff sounds crazy. At the kwoon the other day, a friend mentioned that if he ever got into a bar fight, "I just want to be able to control and handle him." What? That's the way a sane person talks and thinks... about living in a sane world. The fact is because he's sane, and not a trouble maker, he may never find himself in a bar fight. He knows better to avoid that kind of situation. Plus, sane people live in a civilized world where killing and permanently ruining the human body is a disgusting act. ... and they're determined to use violence to get what they want, and violence does not disgust them; they may even enjoy doing it to you. Like the sociopaths at the Kunming train station. They must have enjoyed it, don't you think? It is physically exhausting to run after and hack 17 innocent people. That takes a lot of work. The only way to stop crazy-insane thugs like them is to use violence against them and render them non-functional. None of the victims could have avoided what happened that night. My friend from class knows better than to walk into bars with 'reputations'. Talking sense and communicating to sociopaths doesn't work either. Don't you think these victims pleaded for their life and safety? Don't you think they cried out in pain and horror to what was happening? Yet, the only thing that stopped these psychos, and turned the tables on them so that they became prey, was the fact that the police finally showed up and started using violence at them -- they shoot 4 psychos dead. The others, about 5 of them, quickly turned tail and ran away. Police are still searching for them while I write this letter. The only answer to violence is violence. I recommend you take a look at TFT's resources and purchase their programs. Their real benefit is not the 'cool' techniques they show you (they do not believe in 'cool' techniques), but the mind set you must adopt to use violence and protect yourself. It took me a long time to get mentally comfortable with their training. It's because I'm a sane person. But in order to protect myself from asocial violence, I must think and behave exactly like an asocial predator, and so must you. Lesson #2 Good people must be allowed to protect themselves by any means necessary. The bad guys always find a way to hurt the honest working man, woman, and child. This knife massacre happened in a country where gun rights do not exist. Gun ownership is illegal in China. The reason politicians, from any country, use to disarm the hardworking, honest citizen is because it's supposed to be good for them and it protects them. Hogwash! This is not the place for a discussion on gun rights and gun control. All I can say is that if you do your own research, which does not mean the TV news, you'll find a direct correlation between higher gun ownership and lower violent crime. We should all favor un-restricted gun rights and ownership, the same kind of regulations used to buy kitchen knives or gasoline - none. The only thing that stopped these predators was the fact that the police finally showed up and started shooting them down. A little too late in my book. I'm not disparaging the work by law enforcement. But with 29 dead and 143 injured, it is a fact that they were too late. Private citizens must be able to protect themselves, in an instant, and without having to wait for police to arrive. It is our responsibility to protect ourselves, our loved ones, and our property. Whether you carry a weapon, or allowed or not allowed to by the laws of your home, you always have your bare hands as primary weapons. Learn how to use them for violence. The thugs killed and injured 17 people each. I don't know if any victim fought back, or if they knew how to. But in the rare instance you or a loved one needs to put down a predator, I hope you have the knowledge to do it and the will to use it. TFT's resources can give you the knowledge; take a look at their programs. P.S. TFT has many products to choose from. Where do you start? They'll recommend an entry level program... I started out with their striking and joint breaking series, among a few other smaller resources. Now I'm planning on attending one of their live training events. I believe most of their products include their demonstrations on how to own an asocial mindset. How to think like a predator so you can put down a predator. Small steps are better than no steps. Whatever product you choose, just get started.